For other uses, see Diplura (disambiguation). The order Diplura is one of the four groups of hexapods, alongside insects, Collembola (springtails) and Protura. They are sometimes called "two-pronged bristletails". Around 800 species have been described, of which around 70 occur in North America, 12 in Great Britain and two in Australia. 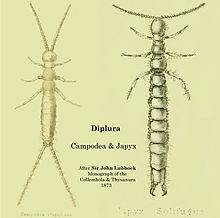 Diplurans are mostly 2–5 millimetres (0.08–0.20 in) long, although some species of Japyx may reach 50 mm (2.0 in). They have no eyes and, apart from the darkened cerci in some species, they are unpigmented. They have long antennae with 10 or more bead-like segments projecting forward from the head, and a pair of cerci projecting backwards from the last of the 11 abdominal somites. These cerci may be long and filamentous or short and pincer-like, leading to occasional confusion with earwigs. These cerci give the group its name, from the Greek diplo ("two") and uros ("tail"). Some diplurans have the ability to shed their cerci if necessary (autotomy). Moulting occurs up to 30 times throughout the life of a dipluran, which is estimated to last up to one year. The abdomens of diplurans bear eversible vesicles, which seem to absorb moisture from the environment and help with the animal's water balance. Diplurans are common in moist soil, leaf litter or humus, but are rarely seen because of their size and subterranean lifestyles. They have biting mouthparts and feed on a variety of live prey and dead organic matter. Members of the family Japygidae are mainly predatory and use their pincer-like cerci to capture prey, including springtails, isopods, small myriapods, insect larvae, and even other diplurans, while members of the family Campodeidae feed on soil fungi, mites, springtails, and other small soil invertebrates, as well as detritus. Those species with long cerci are herbivorous. Like other non-insect hexapods, diplurans practice external fertilisation. Males lay up to 200 spermatophores a week, which are held off the ground by a short stalk and probably only remain viable for about two days. The female collects the spermatophore with her genital opening, and later lays eggs in a cavity in the ground. The hatchlings do not undergo metamorphosis, but resemble the adults, apart from their smaller size, lesser number of setae and their lack of reproductive organs. The relationships among the four groups of hexapods are not resolved, but most recent studies argue against a monophyletic Entognatha. The fossil record of the Diplura is sparse, but one apparent dipluran dates from the Carboniferous. This early dipluran, Testajapyx, had compound eyes, and mouthparts that more closely resembled those of true insects than those of modern diplurans do. ^ Hoell, H.V. ; Doyen, J.T. & Purcell, A.H. (1998). Introduction to Insect Biology and Diversity (2nd ed.). Oxford University Press. p. 320. ISBN 978-0-19-510033-4. ^ a b c David R. Maddison (January 1, 2005). "Diplura". Tree of Life Project. ^ a b c d "Guide to New Zealand Soil Invertebrates". Massey University. 2006. ^ a b c David Kendall (2005). "Diplura". Kendall Bioresearch Services. ^ a b c d e "Diplura". CSIRO Entomology. ^ a b c d e "Diplura". McMaster University. 1999. Archived from the original on 2007-03-27. ^ "Diplura". The Earthlife Web. November 11, 2005. Archived from the original on 2006-12-05. ^ "Diplura". Iziko Museums of Cape Town. 2004. Archived from the original on 2007-09-26. ^ a b c d John R. Meyer (2005). "Diplura". North Carolina State University. ^ A. Carapelli; F. Nardi; R. Dallai; F. Frati (2006). "A review of molecular data for the phylogeny of basal hexapods". Pedobiologia. 50 (2): 191–204. doi:10.1016/j.pedobi.2006.01.001. Sources: Edgecombe et al. (2014), Petrunina (2012) for pancrustaceans. This page was last edited on 1 March 2019, at 22:13 (UTC).